Global markets cheer investors. 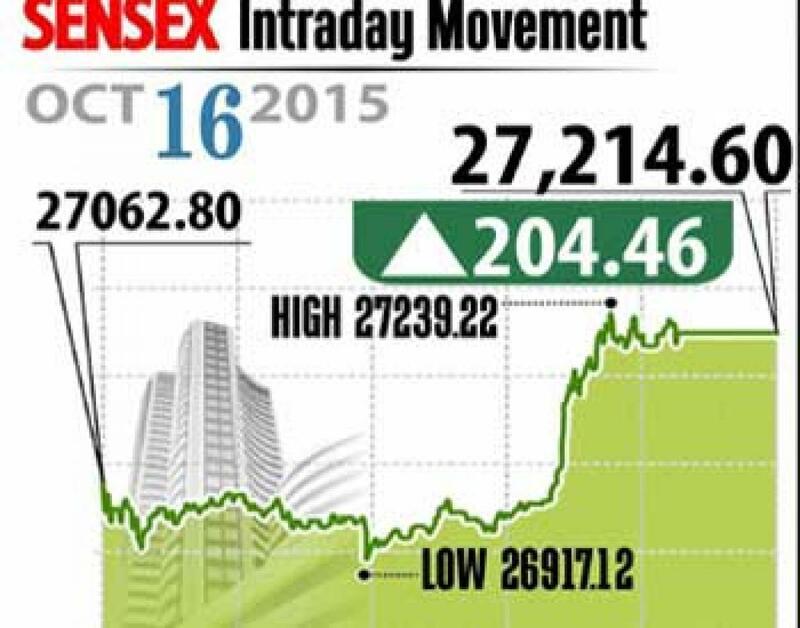 The market rally extended for the second straight day, on Friday led by oil, infra, banking and auto stocks besides positive global cues. Mumbai: The market rally extended for the second straight day, on Friday led by oil, infra, banking and auto stocks besides positive global cues. Sensex closed gaining 204 points at 27,215 and Nifty ended up 59 points at 8,238. Meanwhile, the broader markets also gained on par with the index stocks with midcap gaining 0.4 per cent and smallcap ended flat with positive bias. Analysts assume that the markets would extend gains in the near term and may hit 8,400 on the Nifty and later the market would witness profit booking. On the sectoral front, capital gods and bank indices were the top gainers while other sectors including auto, oil and gas, power indices gained with RIL up about 1 per cent owing to Q2 earnings. From banking space, HDFC Bank, ICICI Bank, SBI and Axis Bank increased up to 2 per cent each, while housing finance firm HDFC gained 1.4 per cent. While auto stocks gained hoping higher demand in the festive season, the stocks include Maruti, Bajaj Auto and Hero HotoCorp gained 0.5 to 1.6 per cent each. The gainers: Larsen and Toubro (L&T), up 2.83 per cent at Rs 1,604.60; State Bank of India (SBI), up 2.39 per cent at Rs 254.90; Maruti Suzuki, up 1.06 per cent at Rs 4,449.90; ONGC, up 1.58 per cent at Rs 264.35; and Tata Motors, up 1.44 per cent at Rs 386.20. The losers: Lupin, down 2.11 per cent at Rs 2,054.95; Tata Steel, down 1.04 per cent at Rs 252.65; Coal India, down 0.98 per cent at Rs 338.45; Hindustan Unilever, down 0.77 per cent at Rs 784.85; and Bharti Airtel, down 0.46 per cent at Rs 349.85.